The simple truth is that we were created for one purpose: God’s glory. In a time when so many are seeking a reason to live, this booklet offers a concise understanding of God’s desire to restore His nature to us, renewing our souls, so that we may reflect His glory in our words, our actions, and our very being. 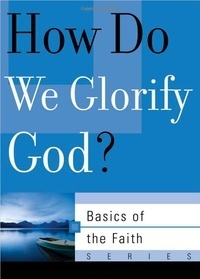 How Do We Glorify God? helps Christians to understand what it means to glorify God and how that affects our everyday lives. This book is part of the Basics of the Reformed Faith series which introduces layreaders to Reformed distinctives.